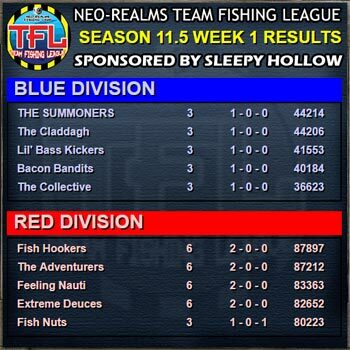 TFL Season 11.5 Week 1 results! TFL Season 11.5 is underway! There will be 4 more weeks of furious fishing before the playoffs begin. Good luck to all teams this season! TFL Season 11.5 is now underway! 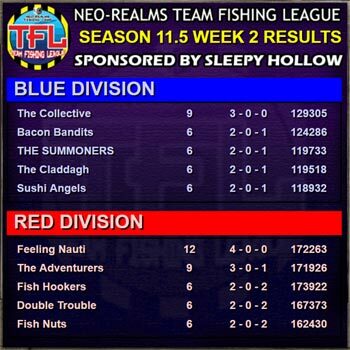 The schedules are posted and matches are now ready to be played for Season 11.5 of the TFL sponsored by Sleepy Hollow! Be sure to complete your matches due before Monday, September 25! Good luck to all teams! Last day for TFL Mini-League Registration! Today is the last day to register for TFL, so be sure to grab a partner and head down to Alston and sign up! Registration will close at midnight and the first match will be ready to play on Monday. If you have any questions please visit tfl.neorealms.com. Double XP all day Labor Day! Enjoy double experience with a worldwide 24-hr XP Happy Hour to celebrate Labor Day starting tomorrow! Have fun!